WASHINGTON (AP) — The "big beautiful wall" has now become "steel slats." 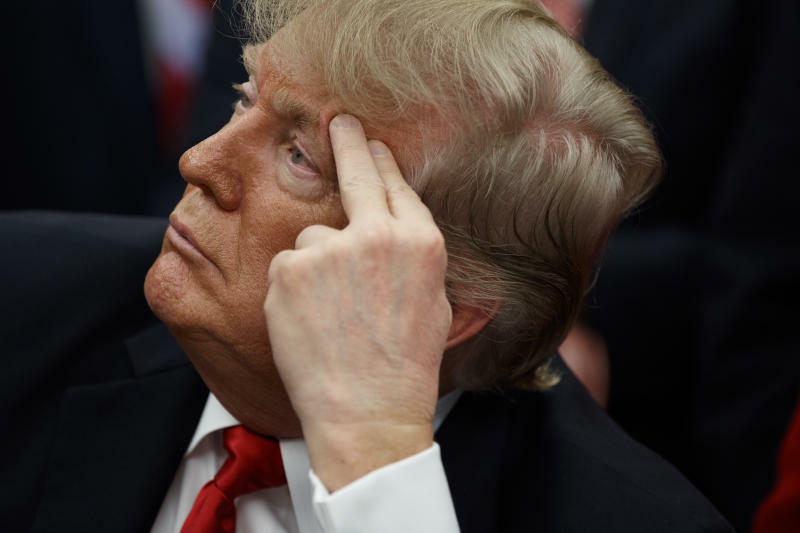 President Donald Trump is tweaking the words he uses to describe the barrier he's hoping to build along the U.S.-Mexico border, in part because Democrats appear more amenable to approving money for "fencing" rather than a "wall." As the budget standoff has played out, Trump has adjusted the way he refers to his long-promised wall, which was the centerpiece of his 2016 campaign. "The Democrats, are saying loud and clear that they do not want to build a Concrete Wall - but we are not building a Concrete Wall, we are building artistically designed steel slats, so that you can easily see through it," he tweeted Tuesday. During a bill signing Friday, Trump went further, saying he didn't care what people called it: "One way or the other we're going to get a wall, we're going to get a barrier, we're going to get anything you want to name it. You can name it anything you want." He later praised the House for "approving strong border security and the money necessary to take care of the barrier, wall or steel slats," adding, "Whatever you want to call it, it's all the same." "Jeb Bush just talked about my border proposal to build a "fence." It's not a fence, Jeb, it's a WALL, and there's a BIG difference!" he tweeted in 2015. And just before taking office, Trump corrected a reporter who'd described his plans as such. "It's not a fence, it's a wall. You just misreported it," Trump said at a post-election press conference. Even before he took office, 654 miles of manmade barrier had been constructed along the border. In the 1990s, Congress provided money under the "Secure Fence Act" and constructed much of what stands today. Many refer to what was built then as "border wall." That changed with Trump, in part because of his specific campaign pledge to build a gleaming, impenetrable "border wall" that Mexico was going to pay for. Now, he wants the American public to pay. And they have. In budget year 2017, Congress provided $292 million to the Department of Homeland Security to build a steel-bollard wall to replace "ineffective" barriers. More than 31 of 40 miles have been constructed, and nine more are scheduled to be completed by 2019. A March funding bill, passed with support from both parties, provided $1.6 billion to build a system that included replacements and new barriers, including levees, steel bollards with narrow spacing between each post and, in some locations, both concrete walls and bollards. The lawmakers' language was notably narrow, limiting the administration to using existing barrier designs instead of the new wall prototypes Trump had built in San Diego near the border. That meant Democrats could continue to crow that they'd given Trump no wall money, while Trump claimed he was already well into construction using money that Congress approved for border security. "At this moment there is a debate over funding border security and the wall, also called — so that I give them a little bit of an out — 'steel slats,'" Trump said Thursday. "We don't use the word 'wall' necessarily, but it has to be something special to do the job."